On December 3, 1574, Limahong and his bandits left Manila for Pangasinan and established a kingdom near the mouth of Agno River. 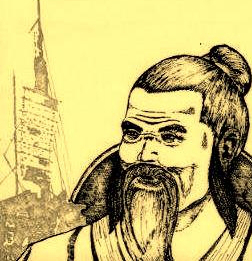 Limahong a notorious Chinese pirate and warlord who invaded the northern Philippine Islands in 1574, announced to the people that he had conquered the Spaniards and that he had come to rule over them as their king. An artist illustration of Limahong (Photo credit: watawat.net). Near the mouth of the Agno River, about four miles from the sea, he built a fort consisting of an outer palisade of palm logs, and an inner enclosure of palm planks which sheltered his palace. He also built pagodas and dwelling places preparatory for permanent settlement. Limahong decided to stay there and to make himself master of the region, be rich and far from reach of the Spaniards and the Chinese emperor. Great terror and fright filled all the neighboring villages, and all of them, with no exception, received Limahong as king, and they obeyed him and paid him tributes. The Spanish colonizers could not tolerate the presence of Limahong, hence they sent an expedition for Lingayen on March 23, 1575. They drove out the bandit who slipped out into the China Sea toward his former lair.